What was once the ancient capital of the Gauls, France’s second largest city now enjoys a reputation as the country’s culinary capital. 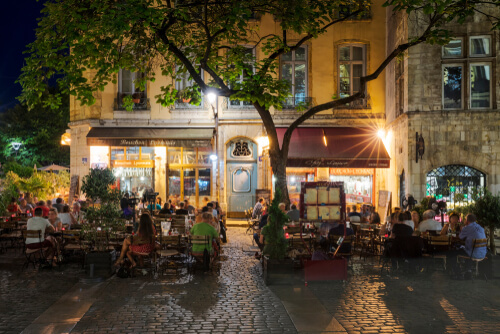 Food and drink aside, this underrated gem – situated on the banks of the Saône in Vieux-Lyon – deserves a stopover for its blend of old world charm and regeneration as a thriving 21st-century city. Anyone who’s visited the Louvre will readily admit that it can’t be seen in a day. Lyon’s Musée des Beaux-Arts is a little more manageable with works by Cezanne, Picasso, Degas, van Gogh and Renoir displayed in 70 rooms divided by provenance. In the south wing you’ll find 16th - 18th-century works while the north wing is for 19th and 20th-century pieces. As you explore Lyon, you’ll come across a number of old Renaissance-era traboules or, passageways and tunnels that run beneath buildings. Said to have been created as early as the 4th century to allow the city’s silk workers to walk to and from their factories, the traboules reveal a number of stories if you keep your eyes peeled. Primarily located in the old town, a good point to kick off your exploration is around Quai Fulchiron Rolland and Rue des Trois Maries. As France’s culinary capital, it’s no surprise that the city has a number of remarkable markets. Aside from the Les Halles de Lyon Paul Bocuse, another is the Quai Saint-Antoine which dates back to 1910 where boats loaded with fresh produce would dock at the quays of the River Saone. Here, 140 vendors sell meat, wine, honey, spices, olives and grains and there’s a focus on regionally-produced food. Popular on weekend, the market doubles as a prime people-watching spot to catch locals (and the city’s chefs) stock up on their ingredients. 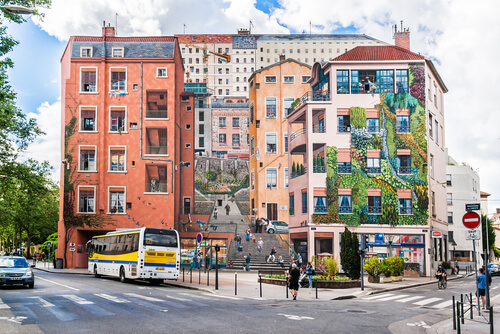 Painted by the Citi Creation co-operative, over 100 large-scale murals decorate the city of Lyon. Beyond a form of urban embellishment, the murals, painted in a trompe l’oeil style, re-tell many historical stories of Lyon such as that of the city’s silk weavers in the Croix-Rousse neighbourhood. They also depict Lyon’s famous figures including the pioneer filmmaking Lumière brothers and Roman emperor Claudius. You don’t have to be in the city during Beaujolais Nouveau Day (it takes place on the third Thursday in November and is held at Place des Terreaux and Place Saint-Jean) to enjoy a glass of this unique wine made just north of Lyon. Produced using only handpicked Gamay grapes, it is characterised by fresh, fruity cherries and raspberries and light tannin flavours. As a result, it pairs well with white meat and is best served chilled. Tucked away on a side street near the Museum of Fine Arts, this family-owned silk workshop is the last of its kind to do silk-screen printing by hand often using 150-year-old silk-screen blocks. The store sells everything from stoles to ties in a range of creative designs inspired by various art movements. Given that the family helps set and treat colours for luxury brands like Hermes, you know that your purchase will be exquisite.